It's likely that Trump will invoke executive privilege during the numerous investigations and inquiries into his actions. Presidents have insisted they need to keep secrets to do their job effectively since Washington, but the term "executive privilege" is relatively recent and it has rarely been tested in court. Justice Kennedy decided to retire at the end of this Supreme Court term. Kennedy has been the swing vote on a lot of important cases. He’s mostly considered a conservative, but he has voted with the more progressive judges on cases having to do with gay rights and abortion. His successor will be appointed by Trump and that has many progressives concerned that the replacement will be even more conservative. Trump has said the taking the fifth makes "you look guilty as hell" but lot of Trump's associates are now taking the fifth in the Russia investigation. How should we interpret people taking the fifth? The Posse Comitatus Act limits the federal government’s ability to use the military to enforce domestic policy within the United States. However, this act has so many allowable exceptions, it has rarely been officially violated. When Trump suggests “The Feds” should police Chicago to get the murder rate down, he might have found the perfect example of a Posse Comitatus Act violation. The Russia investigation has been called a "witch hunt" by Trump and his supporters on Twitter. And they've invoked the legal concept "the fruit of the poisonous tree" to invalidate the investigation. What does the Fourth Amendment say about tainted investigations and does it apply to Trump? The Fourth Amendment says that “The right of the people to be secure in their person, houses, papers, and effects, against unreasonable searches, shall not be violated, and no Warrants shall issue, but upon probable cause, supported by Oath or affirmation, and particularly describing the place to be searched, and the persons or things to be seized.” But at the border, warrantless searches are OK, even when it comes to our digital devices. With Trump's focus on the border, this is becoming a bigger deal. You might not remember December 22, 2017 as a particularly notable day, but I will always remember it as the day the world first saw Donald Trump’s redesigned Presidential Challenge Coin. Because 99% Invisible did an episode about challenge coins and we actually offered our own coin to donors, my association with challenge coins is strong. Because of that, I was forwarded the December 22 Washington Post article about Trump’s garishly over the top challenge coin by about...9000 people. Here’s a story about challenge coins and my reaction to the Trump coin. From "taking a knee" to refusing to salute the flag, the US has a rich history of public dissent, a right guaranteed by the Constitution. But you’d be surprised to learn that the Supreme Court has taken drastically different stands on this right, and now that Trump has tweeted his opposition to certain public displays of dissent, it’s a good time to explore the history of this principle of the First Amendment. Impeachment is talked about a lot, but it is extremely rare. Impeachment is the constitutional emergency measure written into the constitution itself. We talk about the procedure impeachment and why it's so hard. The federal government can't pass any law it wants to. It's limited by Article 1 Section 8 of the Constitution, but the executive branch can choose how to enforce those laws. Under Trump, there are indications that drug laws, which are based on the Commerce Clause, are about to be enforced very differently. The Constitution says that the president can appoint important executive positions with the advice and consent of the Senate. But what if the Senate is out on recess? Does the president have to wait until the Senate comes back? Today we’ll explore the recess appointment power. The Constitution says that a “person holding any office of profit or trust” cannot accept gifts from any foreign state. In Article II, it also says the president specifically cannot accept gifts from “United States, or any of them.” If Trump businesses profit from a foreign or domestic state, is that a violation of either one of the emolument clauses? It’s hard to say, because there is literally no case law when it comes the emoluments clause. None! There have already been a few high profile lawsuits against President Trump and the first defense against such a lawsuit is to claim that the president cannot be sued in civil court. But it turns out, the Supreme Court has ruled different ways on whether or not the president is immune from lawsuits. We look a three cases from history and hear how they’re being used to argue for and against the current cases filed against Trump. In an executive order, Trump threatened to withhold federal money from any place acting as a “sanctuary city.” Supreme Court rulings over the 20th century have ruled in different ways on how federal money can be used to influence the behavior of local governments. When it comes to the Spending Clause, how coercive is too coercive? There are reports that the Trump administration is being investigated for obstruction of justice. This has led a lot of people to wonder if the Constitution’s presidential pardon power could be used to absolve members of his administration, or even himself, from criminal charges. And what does the Constitution say about how a pardon has to be presented? Can Trump pardon someone with a tweet? The US Constitution has a clause that describes how the president can hire certain political appointees with the advice and consent of the Senate. It doesn’t say when the president can fire someone. We take a look at recent Trump firings and put them in context of Supreme Court cases where the court both upheld and denied the president’s right to fire an executive branch employee. Even if a president has the constitutional power to fire someone, it doesn’t mean there aren’t political and legal consequences of the action. Back in February 2017, Trump tweeted a criticism of the “so-called judge” who blocked the enforcement of his travel ban. Why does the president have to listen to what the courts say? We’re going to tell the story of a key moment in history when the president (Truman, in this case) and the court strongly disagreed. Welcome to “What Trump Can Teach Us About Con Law"! 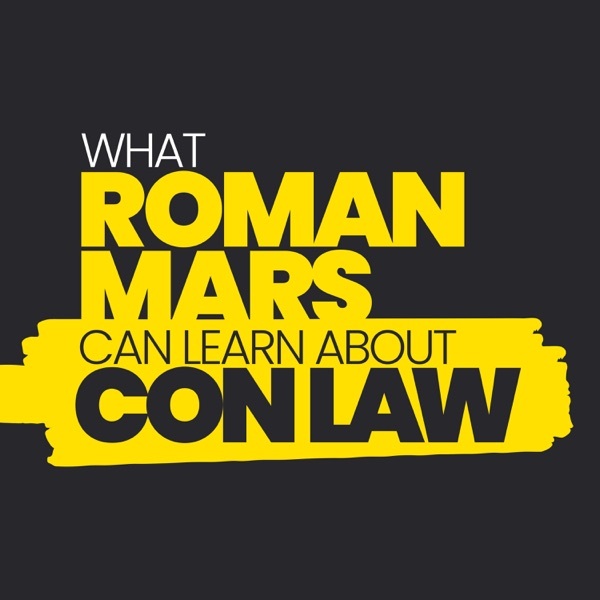 Every week Roman Mars (99% Invisible) will host a fun, casual Con Law 101 class that uses the tumultuous and erratic activities of the executive branch under Trump to teach us all about the US Constitution.